NewBoCo started out as just the Iowa Startup Accelerator, but we knew early on that it would take more than a startup accelerator to fulfill our mission: accelerating world-changing ideas, from Iowa. Startups need more than an accelerator to succeed, and ecosystems need more support than an accelerator alone can provide. That’s why we focused on introducing innovation into education and increasing access for all to high quality programming. Ideas begin with great education. Over the last three years, we’ve expanded our resources drastically to become the perfect place for education startups to launch. If you have an education startup, here’s why you should apply to the Iowa Startup Accelerator (ISA) and join us on our mission to transform education. We geek out over education at NewBoCo, and it’s reflected in our programs. Imagination Iowa is a K-12 STEAM program powered by NewBoCo that encourages creative growth by teaching students coding, engineering, and entrepreneurship skills. All Imagination Iowa courses are hands-on, experiential, and project-based. 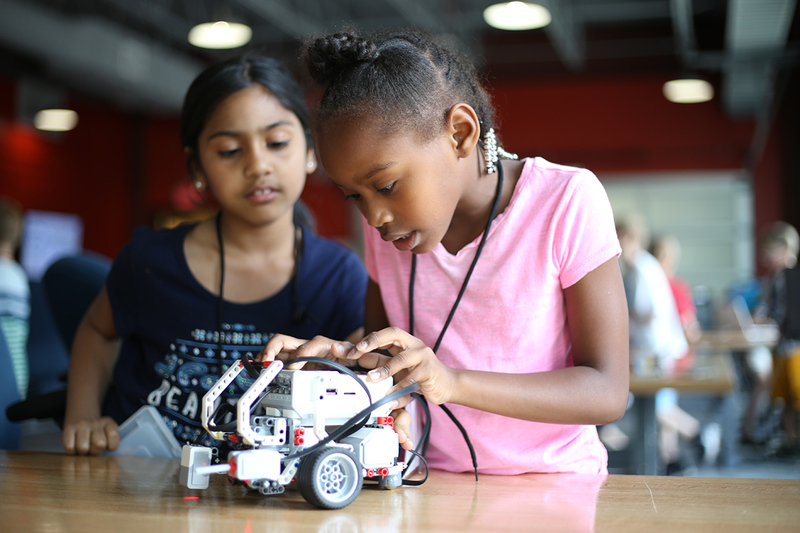 Whether it’s facilitating the Congressional App Challenge, mentoring winning LEGO League teams, or running STEAM-focused summer camps, the experts leading Imagination Iowa programming keep learning at the forefront of everything they do. We’ve involved ISA startups heavily with Imagination Iowa, both as mentors and as instructors. For example, two of our 2016 alumni, WRITTEN Apparel and Girls With Ideas, work closely with our Summer Challenge camps. We’re using Girls With Idea’s curriculum to help middle school girls become confident, creative leaders, and WRITTEN Apparel is leading a course on fashion design. We’re always looking for new ideas in education to test out, and we learn so much from education startups. NewBoCo is also a Code.org Professional Learning Partner and the designated provider of all Code.org professional learning programs in Iowa. Code.org is a nonprofit dedicated to “expanding access to computer science and increasing participation by women and underrepresented minorities.” Through our many partnerships with school districts statewide, NewBoCo provides high quality professional development to educators to prepare them to teach computer science. In short, we’re the regional hub for the global computer science movement. We also partner with school districts in many other ways (sometimes even having our dev team, NewBoCode, build them custom software). This is a huge advantage for edtech startups. We’re meaningfully connected to so many educators, school systems, and advocates for education, and we’re excited to get you connected as well. Location matters. ISA is the only startup accelerator to share a building with a high school recognized by the XQ Super School Project. Iowa BIG, an initiative-based high school, is a member of Vault, NewBoCo’s coworking and collaboration space. They focus on engaging students in authentic community partnerships with project-based learning to deliver core academic credits. In 2016, Iowa BIG won $1 million from XQ, an organization founded by Laurene Powell Jobs to help transform high school education. Their Super School project highlighted the nation’s most innovative high schools, and they couldn’t help but notice the amazing work that Iowa BIG students are doing. (Seriously, check it out here, here, and here. )We collaborate heavily with Iowa BIG. Their students frequently intern for ISA teams, and many of Iowa BIG’s staff members are part of our mentor network. By joining ISA, you’ll work next to people on the forefront of changing high school education. You’ll be a part of the creative energy that fills our building every single day. ISA is a mentor driven accelerator. This means that we believe some of the most valuable and actionable advice startups receive comes from mentors. Because of this, we’ve dedicated time and effort to build Iowa’s largest and most diverse mentor network. Over 30 of our mentors have expertise in education. Their experiences range from founding successful edtech companies to running school districts to leading cutting edge education research and more. Our mentors focus on your success and give you the critical, candid feedback that startups need to thrive. You can learn more about our mentor network and meet our mentors here. This year, NewBoCo also launched Iowa’s premier code school for adults, DeltaV. We partnered with Code Fellows to help adults make the career change to become computer programmers through this immersive, intense program. We started DeltaV to help build up technical talent in Iowa because we’re tired of hearing, “There aren’t enough software developers out there.” Frequently, startups need access to technical talent in order to make their business work. DeltaV students and graduates can fill that gap. “Innovation in education” is a bit of a buzzword at this point, but that doesn’t mean that it’s not sorely needed. I don’t need to relist statistics about why education matters – if you’re reading this, you’re already aware. What you need to know is that NewBoCo truly cares about education, and we are fully dedicated to improving it in anyway that we can. Our startup accelerator is always looking for high quality edtech startups to work with. If you share our drive and our mission, we might just be the perfect fit for each other. Application for ISA’s Summer and Fall Batches are open now! You can apply today, or contact me at molly@newbo.co for more information. I’d love to hear from you!